[Notice] If you already know what to do, DON'T Tell me I messed up. I'm just saying some help. 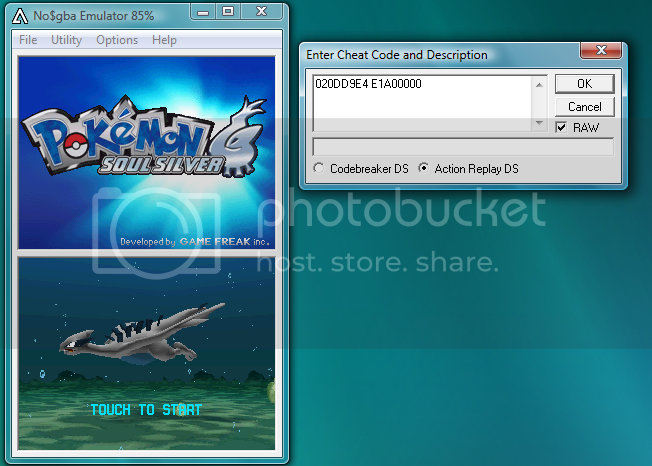 A lot of people are having trouble with The Soul Silvers ROM working on the No$GBA. This should help if anything. A lot of people are saying "Once I go through the beginning part where their is a Black Screen and you can hear the Background Music. To fix this you have to have a Action Replay Code to play the game. Here is the code. Also, Tons of people can never beat the 4th gym because the the ROM will then Freeze and Crash starting you game over. To fix it you have to patch the rom. to do that... I have no clue but I know you have to patch it. i didnt know this was on a emulation already is it slow? signature-"By the time I was your age, I had already dyed these hands in my enemies' blood..."